The Aussie Hind build is continuing. You can see progress on the build log on the Grubby Fingers website. The Cessna Skymaster series has a long history of US Military service. Many saw service in Vietnam as Forward Air Control platforms. Grubby Fingers has now released a pair of new O-2 prints depicting the last two "Oscar Deuce"s in U.S. Military service, 67-21349 and 67-21414. As at January 2010 they were operated out of Yuma Proving Grounds in California. 21414 is one of the O-2s that did see service in SEA. One of aviation's great success stories, the Beech King Air series of aircraft has seen extensive use all over the world. Grubby Fingers has just released some profile prints of this significant commuter. 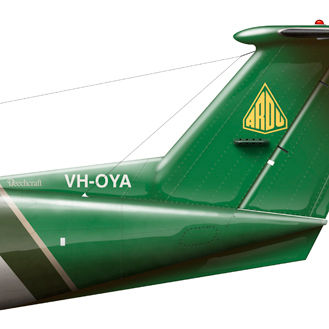 VH-OYA is flown by Pearl Aviation on behalf of the RAAF on training and associated jobs. VH-HPX was flown by the Australian Army in the mid 2000s before all fixed-wing aviation was transferred to the RAAF. Back in the 1980s the NSCA flew a fleet of KingAirs, including this one, VH-NSF. VH-MWZ is owned and operated by the Royal Flying Doctor Service out of Essendon Airport in Melbourne. Detail of the tail of VH-OYA. Here is a by-no-means comprehensive calendar of aviation and modelling related events that will be happening in the near future (or immediate past, depending on how often I get to update it!) around Australia. If there is something you'd like to add to this list, drop me a line here and let me know. On three days of every week, weather and aircraft availability permitting, the RAAF Museum, Point Cook, takes one of its airworthy aircraft up for a display. This means that three times a week you can have your own little air show! The display flights usually last 10-15 minutes and are preceded with an introduction on the ground presenting the aircraft and the pilot and ground crew. After each flight there is a Q&A session where you can get up quite close to the aircraft and ask any questions you might have. These are a terrific and casual way to see some famous aircraft up close and personal. The museum's airworthy fleet includes: CT-4 Airtrainer, Sopwith Pup replica, P-51 Mustang, Winjeel trainer, Tiger Moth and Harvard trainer. Often visiting aircraft are displayed as well. These might include DC3, Cessna O-1 Bird Dog, other Winjeels or even an RAAF PC-9 trainer. And it is completely free! How good is that! The innaugural event with the full show on Sunday following Saturday practice. Family fun programs both days including balloon rides, music, skydivers, gliders, food and refreshmants, trade and other exhibits right through to heavy military iron and battle re-enactments. Criterion Hotel, Quay Street, Rockhampton, Qld. Vietnam Veterans Museum, Veterans Drive, Newhaven, Vic. Always a great day without the huge crowds of Avalon. Gates open at 9:00 am, flying starts at 1:00 pm. Aircraft on dosplay will include: Mustangs, Kittyhawk, Sabre, Winjeel, Tiger Moths, DC3s, Vampire, Sea Fury,, Wirraway, Boomerang, Spitfire and many more! Looks like a big show! Houdini Reserve, Diggers Rest, Victoria. Essex Heights Primary School (TBC), Vic. Wanaka, NZ. One of the world's best warbirds airshows. Temora, NSW. Always a great display of warbirds and classic aircraft! The Caro Convention Centre, University Drive, Ballarat University, Mount Helen (via Ballarat), Vic. Harmonie German Club, 49 Jerrabomberra Avenue, Narabundah, Canberra, ACT. Celebrating the RAAF's 90th anniversary as well as the the 10th Avalon airshow. Trade only Tuesday, Wednesday and Thursday (1-3) and Friday 4th until 2pm. General Public access from 2pm on Friday and all through the weekend. Flying displays will include a night show on Friday.